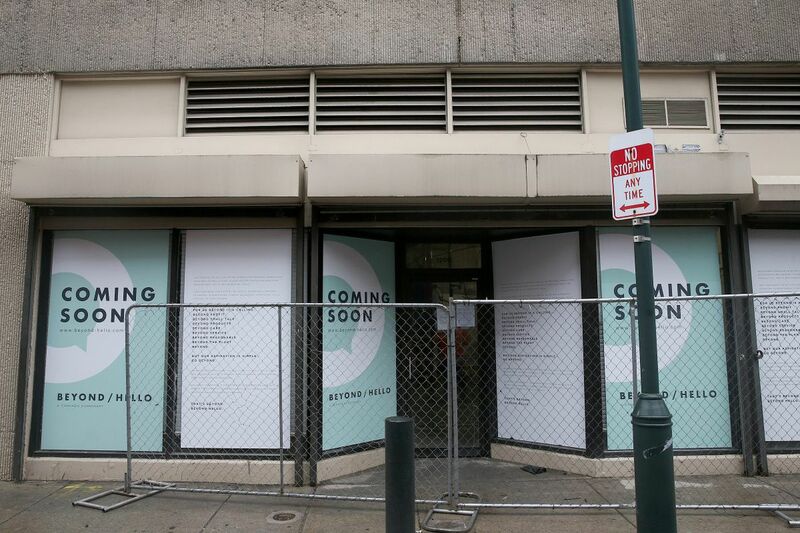 The site of a future marijuana dispensary is pictured in the 1200 block of Sansom Street in Center City on Wednesday, April 25, 2018. Mayor Kenney is calling again for Pennsylvania state stores to sell marijuana products. Mayor Kenney once again called for Pennsylvania to legalize marijuana for adult use and for the drug to be sold at state liquor stores before the Garden State launches its own recreational cannabis sales. Kenney spoke Wednesday on the last day of the Cannabis Learn Conference and Expo at the Pennsylvania Convention Center. "Legalization of recreational marijuana is something the state needs to do," Kenney said, echoing statements he made in May 2017. "New Jersey is poised to do it. Our people will be driving across the bridges and buying recreational marijuana in the state of New Jersey and the state of Delaware." Many observers are less enthusiastic about the state store idea. "I think it's a horrible idea," said Justin Moriconi, a cannabis lawyer based in Elkins Park. "But I think that any way of getting marijuana into an adult use market is a step forward." Steve Schain, who represents marijuana companies, noted that Philadelphia's mayor lacks the authority to proclaim what a state agency such as the LCB should do. Still, "the idea is not far-fetched," Schain said. "Washington State's marijuana oversight body is its Liquor Control Board." But serious impediments remain in this market, Schain added. "Adult-use legal marijuana and spirits are competitors for the same market and the restrictions defining adult-use markets are inconsistent with state store operations." Though most Pennsylvanians detest the state store system, Kenney said it would be "a perfect way" to introduce a marijuana marketplace that would run parallel to the state's medical program, which launched in January. Kenney has advocated for state store sales since at least 2015. "When you were a kid growing up in my neighborhood, the last place you'd be served alcohol underage was a state store, 'cause they'd laugh right at you and say 'kid get outta here,' because they're working on a salary, not a commission," Kenney said. Kenney said he envisioned moving wine and spirits to grocery stores and supermarkets to free up shelf space in the state stores for cannabis products. Taxes generated by recreational sales could be directed to schools and infrastructure projects. The mayor said arrests for less than an ounce of marijuana in Philadelphia have fallen by almost two-thirds from 1,400 a year in 2014. "And 83 percent of those arrested were people of color, because they were the only people [the police] stopped," he said. "We're now down to 400 to 500 arrests — which is 4 to 500 too many," he said. "There's no reason people should be arrested for possessing this substance." As a city councilman, Kenney was the chief sponsor of a bill that decriminalized possession of small amounts of cannabis. He said that decriminalization was part of the effort to address racial and ethnic disparities in the criminal justice system. Kenney said there are some critics who think prosecutions for the drug should continue. He directed them to head to Lincoln Financial Field in South Philadelphia during football season. "If you want to make a lot of marijuana possession arrests, then you should go to an Eagles tailgate about 11 o'clock in the morning," he said, "and you can arrest all the white suburbanites and New Jersey people that you want."